Racism is everywhere in Mafia III, in a way never before seen in a major video game. It’s gotten people talking. 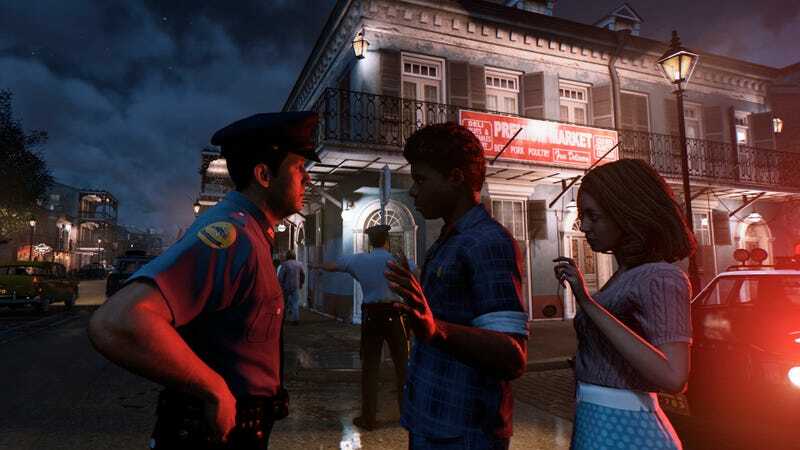 The game is set in a fictional version of 1960s New Orleans. In it, white computer-controlled characters (NPCs) regard the player’s character, a black Vietnam veteran named Lincoln Clay, with suspicion and fear. Some hurl slurs, glare, and call him “boy”... or worse. Police tend to steer clear of the game’s poor, majority-black neighborhoods. They profile you. There’s an indicator for when the police have their eye on you, even when you’re doing nothing wrong at all. Some restaurants and shops are segregated. The game’s characters of color make no secret of the racism they’ve suffered. But the game’s violence is double-edged. Some people, like The Verge’s Chris Plante, have observed that Mafia III deals almost exclusively in cool video game violence. Despite its subject matter, it is, mechanically speaking, a game that is meant to feel good in your hands. “Mafia III isn’t, on its purest level, a game about race,” Plante wrote. “It’s a game about killing and controlling people.” It claims to tell a story of disempowerment, but from the get-go, you are extremely powerful and only become more so over time. The game sometimes feels good at very bad times. As Clay, you wreak havoc not just on KKK members and racist mafias, but also on some good, well-meaning people of color. Even as the game’s narrative unpacks the effect all this violence and mayhem has on people and communities, it’s still at odds with itself. It still feels good on a tangible level, even when you’re doing awful things. Mafia III takes place in the 1960s, but its depiction of racism feels relevant to today. It’s easy to see shards of the period it depicts embedded in modern times like shrapnel. For some players, that’s been eye-opening. The game’s Steam forums contain a lot of conversations along these lines. For every one like that, there’s one or two questioning the need for a black main character, ranting about SJWs ruining video games, or saying they should’ve changed the name from Mafia III to Ghetto 1. The fact that the game takes place in the past may serve as a convenient scapegoat for people who want to believe that the wounds of racism are mostly closed. But people are also pushing back against the “racism against people of color is dead except for that one weird uncle we all have” crowd. Discussions are happening, albeit through gritted teeth and across lines in the sand. The conversation sparked by Mafia III is much bigger than video games. It’s one that’s defined the US since its inception, and one that will continue to define it for decades and probably centuries to come. A video game alone is unlikely to change anyone’s mind, but Mafia III is a step forward—if only a step.